It's that time of the year again and the production company that brought you ‘The Pure Amazing Wizard of Oz’ are back with this year’s offering, Aladdin. 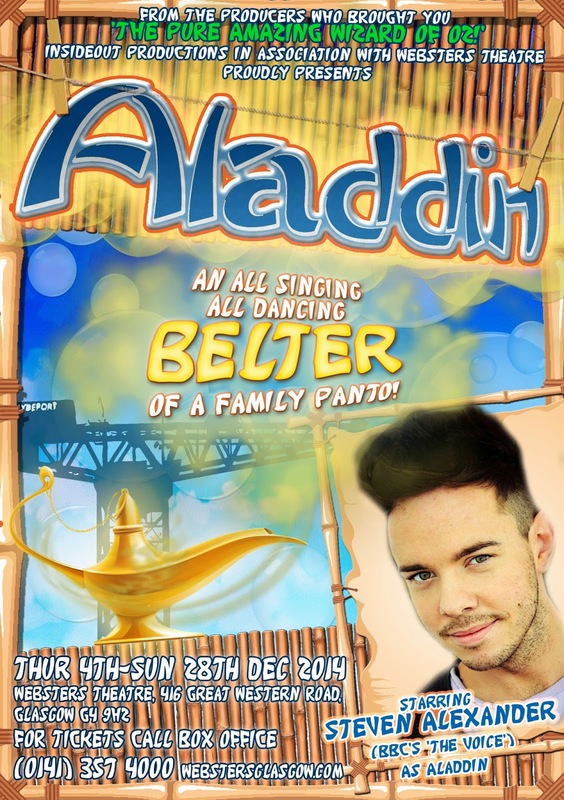 Down in Poor Panto Partick Aladdin has fallen for the emperor’s daughter, Princess Jasmine. The only problem is, he’s skint! When a long lost Auntie appears on his doorstep promising him fame and fortune, he journeys to the place of leaky roofs and sticky carpets (The Garage on Sauchiehall Street) in a bid to win the love of his life. Playing the man of the hour was Steven Alexander who is best known for appearing on TV show ‘The Voice’ and was able to show his off by belting out tunes from One Direction, Beyoncé and more. Natalie Toyne played this year’s baddie Abanazaress and she absolutely nailed it. Funny, scary and a little camp at times she had the audience in stitches with her facial expressions and witty one liners. For me the star of the night came in the form of the show’s dame, Widow Twankee (Neil Thomas). He had great stage presence and really built up a rapport with the audience which gave the show a personal touch. In typical Insideout fashion a couple of tweaks were made to set the story apart from others. Both the Genie and the Slave of the Ring were Sesame Street style puppets and instead of a flying carpet there was a flying broomstick (which came with a few Wicked references much to my delight). The writing had a great balance of obvious humour for the kids and innuendos for the adults and made a lot of references to pop culture, including a sly nod to the indy ref.